Can A Burglar Access Your Home Via Key Entry? He Can in 90% of U.S. Homes. Memorial Day weekend is upon us and so therefore are home burglaries. And let’s face it – with the uptick in family travel and vacation during holidays and the fast-approaching summer season, one can reasonably presume that the number of home break-ins will increase dramatically during the next several months. From time to time in the upcoming weeks, we will post security tips that we hope will increase your personal security risks and management. This week we will concentrate on the first usual point of entry – the family home door. Whether it is the front, side or basement door, burglars know how to get inside and to your property. As if evilly purposed technology isn’t bad enough, the old-fashioned methods of breaking and entry are still widely used by burglars. A phenomenon known as ‘lock bumping’ is on the rise. It’s a little-known technique that’s fast, simple, and very discreet. It draws far less attention than breaking in a window or tearing down a door. If your cylindrical door lock is one of the more popular brands or models on the market – and 90% of home door locks are cylinder-models and ACME types – you’re vulnerable to this particular type of illegal home entry. Lock-bumping requires a bump key. A key type is determined that fits inside the target lock. In most cases, a particular model of lock will accept all keys from that model because only the teeth of the keys are different. In other words (and as mentioned above), once a burglar has an Acme-model bump key, it could open all other Acme-model locks. Cut one’s own bump key. With a copy of the key in question made, a burglar will then use a metal file to create his own bump key. All of the valleys are filed down so that they are even with the lowest point in the teeth. 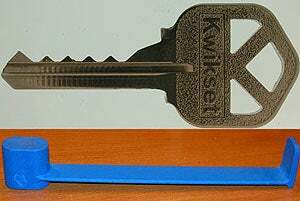 A special “bump” key is inserted into the target lock and then struck with a tool made of rubber or plastic, such as this blue tool on the bottom of the image. The impact of the bump key on the tumblers inside the lock temporarily pushes them up, allowing the lock’s cylinder to turn. When done right — and it’s not hard to learn — this method can quickly and quietly open a lock. In our next mid-week Beacon Bulletin, we will bring you information and videos on how to bump lock-proof your home.Just remember that your personal safety and that of your family is paramount. Whatever knowledge in this area that we may impart, do not back up it with a plan to confront a burglar unless it is absolutely necessary. If a successful entry does occur, hopefully, no one will be home and material possessions are not worth a life.